Desert Strike, is a shoot 'em up video game released by Electronic Arts (EA) in February 1992 for the Sega Genesis/Mega Drive. The game was later released on several other formats such as the SNES, including a much upgraded version for the Amiga home computer. The game was inspired by the Gulf War and depicts a conflict between an insane Middle Eastern dictator, General Kilbaba, and the United States. The player controls a lone Apache helicopter and attempts to destroy enemy weapons and installations, rescue hostages and capture enemy personnel, while managing supplies of fuel and ammunition. 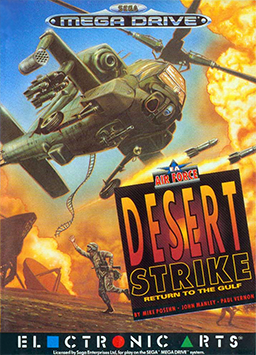 Desert Strike is a shoot 'em up game in which the player pilots an AH-64 Apache helicopter. The game is less frantic than typical shoot 'em ups, with the addition of greater strategic elements. The game was developed by a team headed by Mike Posehn. In the 1980s, Posehn had previously worked for EA as a software developer. Soon after leaving EA, he obtained a publishing deal with the company for Video Deluxe. The success of the software spurred Posehn to branch out and experiment with a flight simulator titled Fly for the IBM Personal Computer; however, International Business Machines cancelled the project. Posehn later met with EA president Trip Hawkins who suggested that Posehn develop a game for Sega's Genesis, which was soon to be released. He also recommended that Posehn create a game similar to the Apple II game Choplifter; Hawkins felt flying a helicopter and rescuing people was "cool".